Da Nang (Đà Nẵng) is Vietnam's third largest city, and is located on the Eastern Sea coast, midway between Hanoi and Ho Chi Minh City and the largest city of Central Vietnam. The city itself has neither the atmosphere of Hanoi nor the hustle-bustle of Ho Chi Minh City, but has its share of sights and is close to the charms of Hoi An and the imperial capital of Hue. 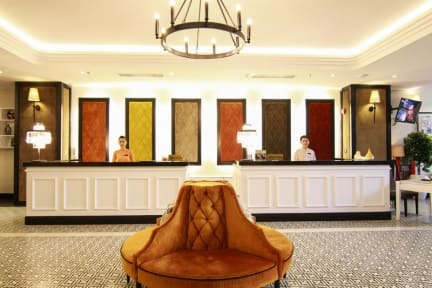 Situated in the city of Da Nang, Sanouva Danang Hotel is housed in a stately heritage building. The hotel is uniquely designed to bring the highlights of the area, combining a rich heritage with modern styles. Sanouva Danang Hotel is located only 5 minutes from the Da Nang International Airport and another 7 minutes from the beach. 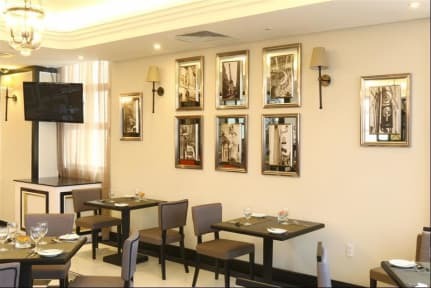 The hotel offers guests with a variety of services and facilities which include massage services, beauty salon and a well-equipped fitness center. The club at the hotel also features a relaxing Spa center. Sanouva Danang Hotel is an ideal accommodation to rest, travel and visit on business. 1). At least 72 hours in advance notice for free cancellation. The deposit is non-refundable. Late cancellation or modification or no show, 100% of the total booking will be charged as penalty. I saw the Sanouva reviewed as a bijou hotel in Danang and booked a stay for 4 days. Everything about this hotel is first class from the guys at the entrance to the ladies that cleaned our room. They all make you feel special. The food in the restaurant although not a huge selection is very tasty and breakfast sets you up for the day. It is spotlessly clean from top to bottom. The Sanouva is a few minutes walk from the riverside and Dragon bridge and close to the market and other tourist places. Good for a hotel. Nice if you want to get away from hostels for a night. There was no hot water in the mornings and the service was lacklustre.